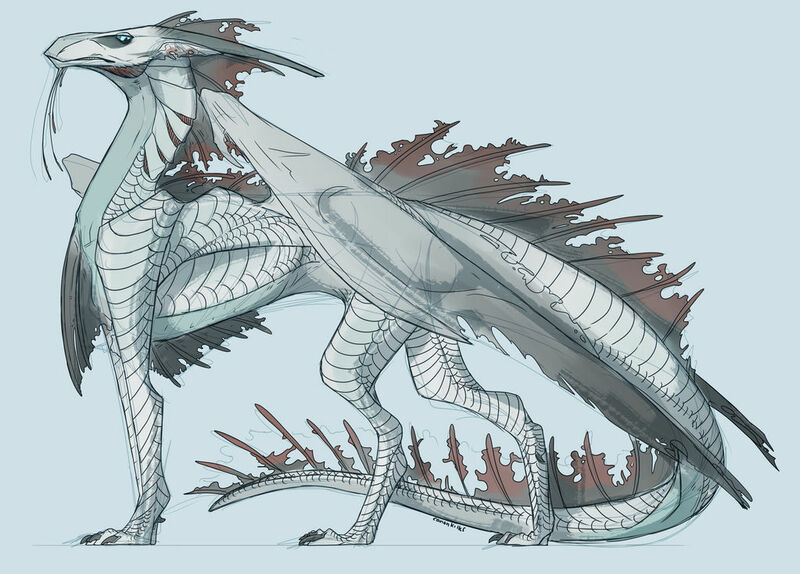 Personality: Ra'Shei is a very independent dragon. While he is fine with his Tribe depending on him, he is not so eager for himself to depend on anyone else. This causes him to be aloof and not very talkative, only speaking when his voice must be heard [which is quite often, considering he is the IceWing Alpha]. The male is very serious and doesn't have much of a sense of humor. While he looks intimidating, he is not cruel. Another fact about Ra'Shei is that he is not very trusting of others, not even his own Betas. This will make it difficult for him to get a mate. ☆Ra'Shei is agile and has fast reflexes, both on foot and on wing. This makes him good at dodging in combat. ☆He is also quite clever, able to see through traps and schemes and find a way to fool his opponent. ☆Because he is slender and thin, Ra'Shei is able to slip through spaces most others cannot. ☆Like most IceWings with pale hides, he can blend in well with the snowy environment. ☆Ra'Shei is not very skilled in head-on combat. He is much more proficient at outsmarting his enemy. ☆Because he is not very trusting, Ra'Shei does not have many allies he can properly rely on. ☆His weak spot is his belly, where his scales are softer and easier to tear through. ☆Due to his pale coloring, Ra'Shei sticks out like a sore thumb in any genome other than the tundra. Scales: Smooth, solid white scales with a gentle shine in light. Overlapping like armor. Greyish-blue underbelly. Appearance: Ra'Shei has a weathered look to him, being incredibly slender and thin with torn wings and webbing. He has a rather old, grizzled appearance despite not being that aged for a dragon. He has long legs, claws, tail, and an elongated narrow snout. Ra'Shei has thin webbing along his spine starting at the back of his head and some on his chest. The webbing is translucent and greyish in color with red tints at the edges. He has long, grey horns on his head and trails of webbing on his chin. His wings are large and translucent, going down to a dark shade of grey. All in all, Ra'Shei looks quite regal with looks fitting for a king. Family: Undetermined. Most likely deceased. ☆Like all IceWings, Ra-Shei has the ability to exhale frost from his maw. This breath can travel as far as 25 feet and is cold enough to freeze prey and form a thin ice shell on other dragons on the place of impact. It will sting and burn for non-IceWings, but it can be broken off with ease. ☆Ra'Shei has immunity to the cold as well, but ice breath from other IceWings still hold effect on him. ☆Ra'Shei has the ability to grow ice spikes from his back and tail and shoot them out. Much like the Needler from the Halo franchise, the spikes shatter on impact. The spikes are three feet in length and are very sharp, able to pierce dragon hide and kill humans. This ability can be used once every three posts. Combat Style: Ra'Shei fights using his nimble body and his special abilities. He uses his agility to dodge attacks and land a hit where his opponent does not expect. History: Ra'Shei was an IceWing Scholar at the time the apocalypse hit. He fled from the IceWings and lived as a rogue for a few years before deciding to rebuild his Tribe and take the spot as leader. Approved. Congrats, IceWings, you have a new leader.